Brace yourself as the feel-good musical Hairspray makes a triumphant return to Aberdeen after a one-year hiatus. The show opened on Broadway in 2002 and has wowed audiences ever since. It was hard to feel anything but joy as the dazzling cast burst on to the stage at HM Theatre last night. Set in a racially segregated 1960s Baltimore, we follow quirky, fun-loving teen Tracy Turnblad as she pursues her dream; to dance on the Corny Collins Show. The colourful and creative set made the perfect backdrop for the upbeat songs that kept the show bouncing along. Rebecca Mendoza leads the all-star cast as feisty and funny Tracy. Infectious happiness radiates from her as she sings, dances and acts her heart out in an admirable performance by the recent Italia Conti graduate. Tracy boldly strikes out against injustice, fighting against the institutional racism of the Corny Collins Show and fighting for the rights of her friends too. In the process she catches the eye of handsome heart-throb Link Larkin – played by a charismatic and smooth as silk Edward Chitticks. Her coquettish crush provides many humorous moments in the first act. Mendoza’s Tracy is perfectly complemented by the hilarious Matt Rixon and Graham MacDuff playing her loving parents, Edna and Wilbur Turnblad. Their comic timing is undeniable, keeping the audience howling in their seats right from the get-go. The duet You’re Timeless to Me was affectionate and humorous as the pair struggled to stop themselves from laughing as they twirled around the stage. Brenda Edwards stuns as Motormouth Maybelle, sending shivers down the spine with her jaw-dropping vocals in songs such as I Know Where I’ve Been. Hers is a truly knock-out performance that shines brightly amongst a hugely talented cast. Layton Williams, playing her teenage son Seaweed, is equally mesmerising; he spins, jumps and backflips through his entire performance, transfixing the audience as he goes. Charm is in abundance during his engaging and vibrant rendition of Run and Tell That. Standing in the way of the youngsters’ goal for equality is Velma Von Tussle (played by accomplished performer Gina Murray). A former Miss Baltimore, and a force to be reckoned with, she’s the formidable and pushy mother of Amber who leaves an impressive trail of destruction in her wake. Murray’s performance is almost cartoonish, playing her with such vindictiveness that you end up laughing – instead of cowering in your seat. Other standouts include Annalise Liard-Bailey’s ditzy Penny Pingleton and Monifa James’ feisty Little Inez. Drew McOnie’s sparkling choreography keeps the audience on their toes throughout. The show is expertly crafted with a fantastic live band and great lighting. There’s no denying that this energetic and cheerful musical will pick you up – even on the coldest of March nights. 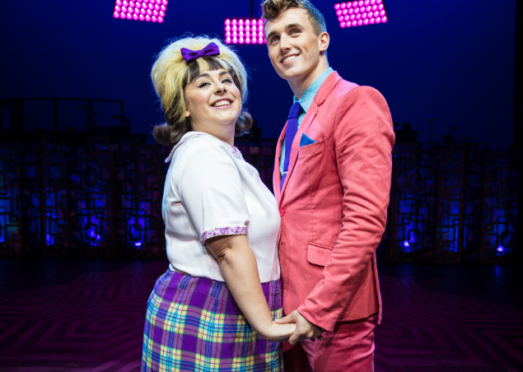 Hairspray can be seen at HMT, Aberdeen until Saturday.